Critics have long cried foul over the construction of malls in New York City’s densest borough, and in recent years developers have dropped the term in favor of euphemisms like vertical retail environment.. Asks Deborah Grossberg, are the indoor shopping mazes rising up across town really a different breed? Malls are a menace to New York: they drain the life out of vibrant neighborhoods by siphoning customers away from street-level retail and repelling Manhattan residents, leaving behind chintzy eyesores crowded with vacationing suburbanites. Or at least that’s the conventional wisdom. But in recent years, as big-box stores and glitzy mall developments planned and funded in the bull-market 1990s appear in high-traffic pedestrian areas from Union Square to Harlem, fears among urban planners and theorists have shifted focus. 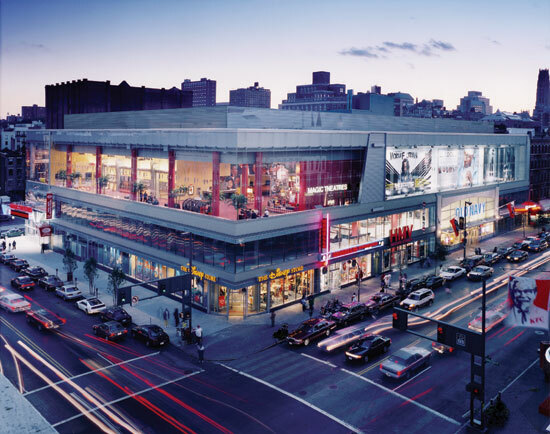 New York City developers and architects have improved on the old models for urban malls, and the rapid gentrification spurred on by Mayor Giuliani’s city clean-up effort combined with the development-friendly policies of the Bloomberg administration have encouraged a mall-city merger on a broader scale. While the new urban malls are more profitable and better connected to the street, small-scale street-level retail has started to look increasingly homogenized, chained-out, and mall-like. When Manhattan’s first enclosed shopping malls opened in the 1980s, urban planners and theorists worried that the new megaplexes might herald an era of suburbanization for New York. Everyone was enraged when Trump built his mall 20 years ago and now it seems relatively benign,, said architect and critic Michael Sorkin. I’m a bit agnostic about these new developments.. Other critics have been less tentative. In December, one of the most popular new developmentssThe Shops at Columbus Circleewon the Municipal Art Society’s (MAS) 2003 MASterwork Award in Urban Design for the best new privately owned public space. Rick Bell, executive director of AIA-NY and one of the award jurors, said, Since 9/11, many of the city’s great public atriums have been closed off to pedestrians due to security concerns. The entrance hall at the Shops is an indoor-outdoor space with spectacular Central Park views that’s open to all New Yorkers.. Malls have always been the domain of the middle class, and though the new Manhattan developments vary from bargain-basement to the height of luxury, they still represent a populist influence on the city’s retail. Politicians and planners usually use malls as lures for the white middle class, but for Manhattan it’s been reversed,, said Jeffrey Hardwick, author of Mall Maker: Victor Gruen, Architect of an American Dream (University of Pennsylvania Press, 2004). The middle class has come back to Manhattan and malls have followed.. Some say that the relative silence of mall-haters is the result of a wising-up on the part of the city’s retail developers. Developers and retailers have gotten smarter about building in Manhattan,, said Peter Slatin, creator of the real estate news website The Slatin Report. They’re working together to make more integrated vertical malls.. In attempting to redefine the urban mall, today’s developers begin by banishing the term itself. Early shopping centers like the Manhattan Mall, which opened in 1989 at the corner of Sixth Avenue and 33rd Street, stuck to straightforward names and standard mall design. Introverted shops and cheap ddcor marked them for what they were. 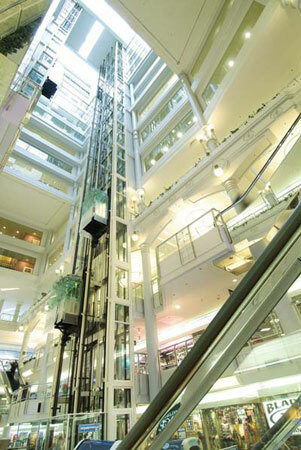 Those malls never resonated with New Yorkers,, said Bell. New mall developers avoid that negative image, instead conjuring jargon like vertical retail environment,, which is The Related Companies and Apollo Real Estate Advisors’ preferred tag for their Columbus Circle shopping development. Historically, making vertical retail work has been impossible in a city where land values are too high to give the classic two-story mall model financial feasibility. In order to draw shoppers up to higher levels, architects and developers have improved connections to the neighborhood outside, executing transparent, extroverted designs. Harlem USA, the shopping development at the corner of 125th Street and Frederick Douglass Boulevard that opened in 2001, emphatically rejected the typical introverted suburban mall style invented by Viennese architect Victor Gruen in his 1956 prototype for the modern mall, The Southdale Center in Edina, Minnesota. At Southdale, Gruen closed off stores from the street, taking total control of the retail environment. When SOM was commissioned by Grid Properties to design Harlem USA, the firm focused on turning the Gruen model inside out. We created an anti-mall,, said Mustafa Abadan, the project’s manager at SOM. 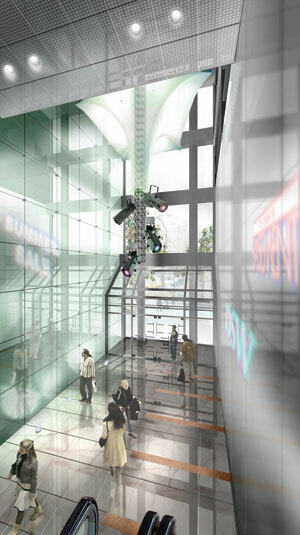 The roots of New York retail are at the street level, and the idea was to engage that energy, to draw it in by orienting out.. SOM did away with internal circulation; The upper floors of individual stores are only reachable through escalators within the stores, and the lobbies of the third floor movie theater, accessible via an independent street-level entrance, face outwards. Even though the stores are bigger, they maintain the essential New York street typology,, said Abadan. Harlem USA has drawn much more negative press than the Shops due to its location in an historic neighborhood. Area shop owners make the standard arguments that chains have drawn business away from mom-and-pops, and that the character of the neighborhood is suffering. Others see the development as an important step in Harlem’s economic renaissance. Harlem USA brought customers to the neighborhood who would otherwise have shopped on 34th Street or Downtown,, said Abadan. 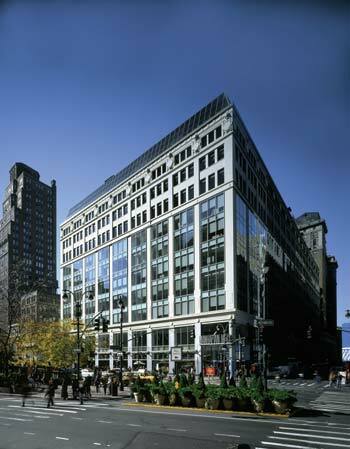 The Vornado Realty Trust shopping development at the southwest corner of Union Square also used transparency to ensnare shoppers. In Manhattan, people see shopping as sport,, said JJ Falk, principal of JJ Falk Design, the firm that designed the Filene’s Basement, DSW Shoe Warehouse, and interior circulation for Vornado’s Union Square development. It’s like visiting a museummif people like what they see, they’ll stay in the space longer.. A glass towerr of circulation is meant to draw street traffic up from the Union Square transport hub, and Falk located the escalators within the three-story Filene’s Basement flush with floor-to-ceiling glass walls facing Union Square. It’s like you’re in the park,, said Falk. DSW and Filene’s opened at the Union Square location in October and a Whole Foods Market is slated to open later this year. Although preliminary sales data for the stores were unavailable, Falk said that the entire construction cost for the project would be recouped in six months should current sales trends continue. Neighborhood tie-in was important to developers of The Shops at Columbus Circle as well. It was first a matter of creating great spaces for pedestrian passage to tie the city together,, said Howard Elkus, a principal at Elkus/Manfredi, the Boston-based firm specializing in retail architecture that designed the Shops. Their design weaves the retail space of the Shops into the city grid with two axes of circulation, one curving around Columbus Circle’s arc, and the other sweeping up 59th Street into a five-story, 150-foot-high great room.. The minimal boundary between mall and street was emphasized through James Carpenter Design Associates’ design for the entryway’s faaade, an 85-foot-wide, 150-foot-tall cable net glass wall that boasts the title of largest in the world. Besides an emphasis on transparency, Related and Apollo banked on the position of the 365,000-square-foot Shops at the heart of the 2.8-million-square-foot mixed-use Time Warner Center (designed by Skidmore, Owings & Merrill) to offset the enormous cost of building in New York (The Time Warner Center cost a total of $1.7 billion) and to justify the astronomical annual rents for prime retail space ($300 to $400 per square foot). 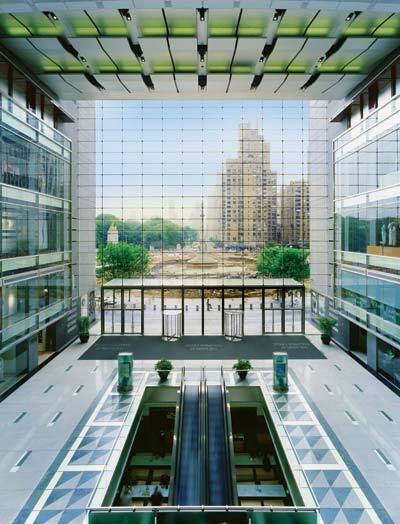 The classic anchor store model was supplemented with luxury residences, high-end office space, five top-tier restaurants, and a concert venue for Jazz at Lincoln Center (designed by Rafael Viioly Architects). The Shops therefore have a better chance to become a destination for shoppers from New York as well as farther afield. Moreover, the development’s high-end mix of shops is as good a fit for Upper West Side shoppers on the way home from work as it is for tourists making a beeline from Times Square to Central Park. One big attraction has been the 60,000-square-foot Whole Foods Market in the complex’s basement. Although some complain about the grocery store’s high prices, most have seen it as a godsend. Cities don’t need malls to function as community centers as they do in the suburbs, but when they’re combined with the things that people loveeand in New York that begins with fooddthey have greater potential for success,, said Bell.. The approach to luring customers with extensive mixed-use developments comes closer to realizing the utopian dreams of early mall designers like Gruen. At Southdale, Gruen planned apartments, a park, a medical center, even schools to accompany the mall. It looked like a Corbusier plan with towers and green space,, said Hardwick. Gruen’s fantasy suburban city was scrapped for lack of budget, a fact to which he often attributed the ultimate decay of his vision. The question now is whether the inclusion of residential, cultural, and palette- pleasing elements will function as planned. It’s unclear whether it will actually pay off, or whether it’s just a new PR spin,, said Hardwick. Now nearing its first anniversary, the Shops report promising numbers, with higher sales than expected and 99 percent of its 347,000 square-feet of leasable space occupied. 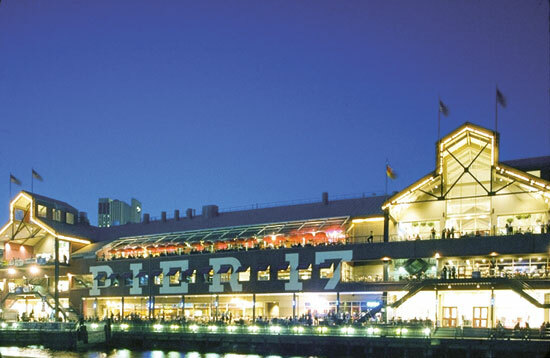 The South Street Seaport mall is one decades old development that has consistently struggled to turn a profit. As malls adapt to embrace city life, planners seem more concerned about what urban historian and professor at Harvard’s GSD Margaret Crawford termed spontaneous malling,, the process by which an urban space starts to take on the qualities of a mall without the aid of developers. At this point, Broadway in SoHo is a total mall,, said Crawford, who wrote the essay The World in a Shopping Malll published in Sorkin’s Variations on a Theme Park (Noonday Press, 1992). Broadway, which used to sport hip boutiques and galleries, is now lined with chain outlets like Old Navy, Crate & Barrel, and Sephoraathe same stores found in suburban malls. Spontaneous malling is happening more and more, and cities consider it desirable since it attracts suburban shoppers, in this case from New Jersey..
Business Improvement Districts (BIDs) are often the culprits in emerging street-as-mall phenomenon in New York. By organizing signage, street furniture, wayfinding, and even the uniforms for garbage collectors, BIDs often induce mall-like situations. Said Slatin, It’s a constant tug-of-war over whether to homogenize a neighborhood or leave the jumble. There’s value in the order, especially in terms of security and comfort for tourists, but at the same time the city has a way of making its own order..
Manhattan has managed to remake malls in its image, while the traits that make up malls have quietly bled into the city’s fabric. There have always been cries that the mall is going to kill things or that it’s dying,, said Hardwick. The amazing thing is how flexible the form actually is.. Even in a city with such a vibrant retail culture, the mall has found ways to penetrate. The end result in Manhattan has been two surprisingly similar variations: the mall as city and the city as mall. Deborah grossberg is an associate editor at an.